Sunshine and Showers over Lake Coniston Oil on gessoed card 8"x10"
We spent a lovely week recently at Lake Coniston in Cumbria walking the hills and canoeing on the lake. 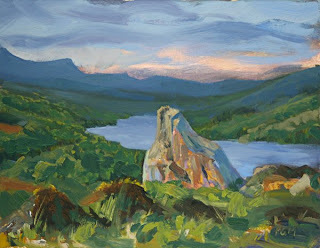 I painted this view from the hills at the southern end of the lake several times. The day I did this painting had rained almost incessantly but in the evening the cloud broke up a bit and the light, when the sun shone through was amazing. I've set up this site as a sort of diary to plot my progress as I continue to paint. I have been inspired along the way by many other artists who are using the internet as a way to share their art with the wider world. My main focus is in plein air landscape painting and still life. I live in the north of England and am fortunate to be surrounded by a variety of wonderful landscapes.